After the Great Fire of London in 1666 there were apparently a lot of lazy Paupers hanging around while the rest of the population tried desperately to rebuild the city. Sometimes you could educate them in a school and have them help out or send them away on ships or throw them in prison. This is what I’ve learned from the game London not what I hastily looked up on Wikipedia. What I did look up on Wikipedia was Oliver Twist to see if I could make a clever pun related to this game for the title. He did fit right in with the time period of London but I just couldn’t find a way to work him or the Artful Dodger in, perhaps next time! 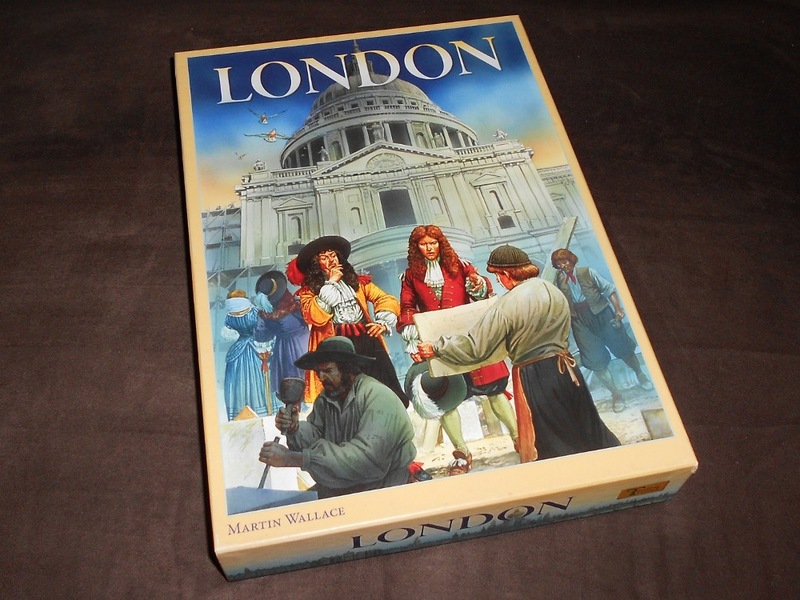 London takes place after the Great Fire and tasks the players with rebuilding and managing the city. Each player is in charge of running part of the city where they will construct buildings, expand, and deal with the poverty caused by overpopulation. At it’s core London is a Tableau Building game, the players have their own Building Display where they play cards that represent the buildings that they are constructing in their part of the city. There is also a shared board with a map of the city where land (referred to as boroughs) is purchased. The cards in the game are separated by three phases each of which are shuffled separately and then stacked such that the more powerful cards show up in the later phases. This creates a gradual ramping up of abilities throughout the game and represents a shift of focus from money in the early stages of the game to victory points at the end. Cards from the first part of the game, lazy Paupers (grey) don’t do anything. On their turn a player must first draw a card and then can perform one of a number of actions. The first action is to play cards from your hand to your Building Display. In order to play a card, another one of the same color must be discarded to a shared Card Display. Cards played to the Building Display can either be placed on top of a card already in play or in an empty space. Some cards have an immediate cost that must be paid when the card is brought into play. The second action is to purchase land, this is done by selecting an unoccupied boroughs on the main board, paying the associated cost, and marking the area with a counter. 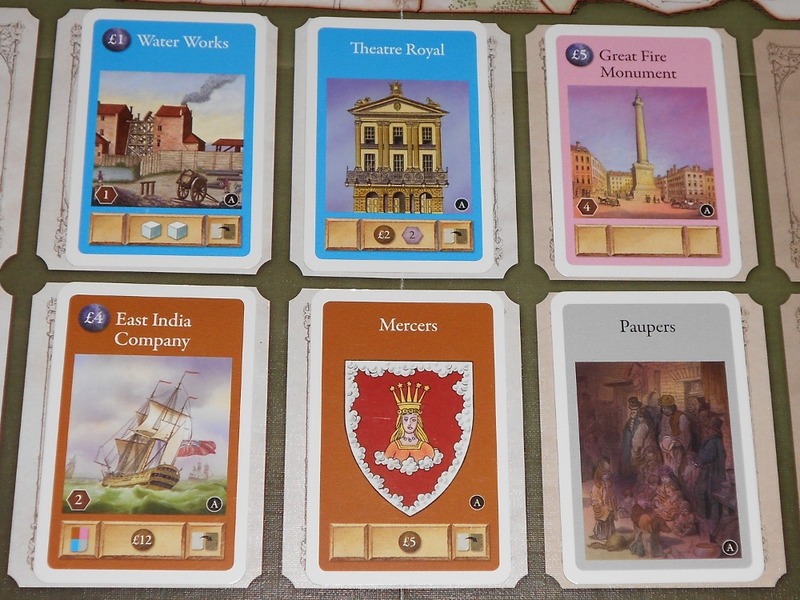 Each borough designates a number of cards that are drawn when the land is purchased and has a value in victory points that are scored at the end of the game. After purchasing the borough, cards are drawn in any combination from the deck and the Card Display. The third action is to run your city, this is done by activating any number of cards in your Building Display one at a time in any order. Each card has an activation cost requiring either a card to be discarded, money to be spent, or nothing at all. Then there is a card effect which generally generates money, victory points, a gain or loss of poverty, or some combination of those. Lastly there’s an indicator of whether the card should be flipped over after activation. The majority of cards are flipped after activation but there are some that stay face up and can be used as long as it doesn’t get covered up. After running your city you will gain poverty based on the number of card stacks in your Building Display and cards in your hand reduced by the number of boroughs that you occupy. The game end is triggered when the last card has been drawn from the deck, all players receive one additional turn and then the game is over. 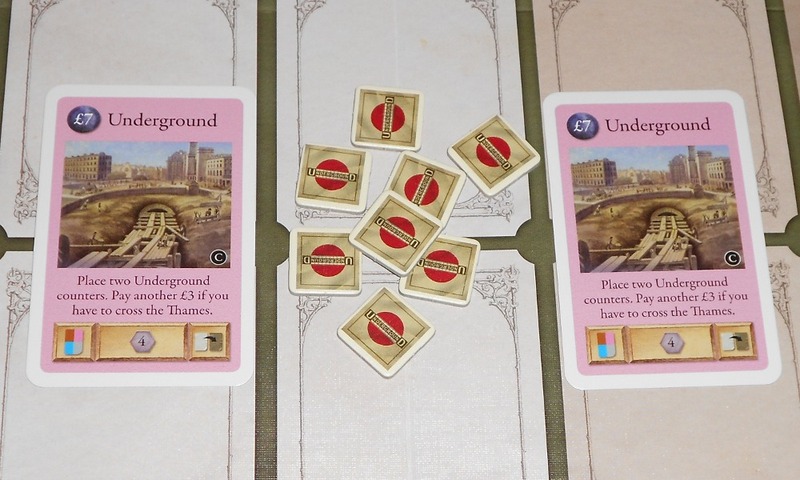 Points are added up from those received during the game by activating cards, points on cards in your Building Display, and points from boroughs. 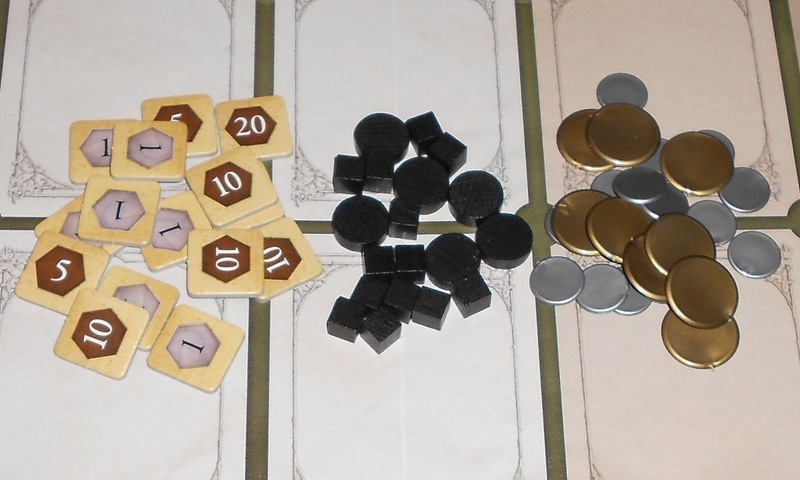 Then each player discards a number of poverty equal to the player with the least poverty. All remaining poverty are worth negative points. Most points wins and becomes the new mayor of London, you’ve earned it! Should You Help Rebuild London? One of the intriguing aspects of London is how the poverty system maintains an interesting level of tension and balance. The main factors involved in poverty are the number of stacks in your building display (more is worse) and the number of boroughs occupied (more is better). This is a nice thematic touch because the stacks are supposed to represent population and poverty is often caused by overpopulation so the larger your population (number of stacks) and less space (number of boroughs) the more poverty you will generate. But back to why this is interesting for the game. First off, the more stacks in your Building Display the better for optimizing your actions. When you run your city, if you have a lot of cards to activate then you are getting many more activations out of one action compared to someone with less stacks. However there are two major downsides. First, you are gaining more poverty for running a large city. Second, you have to wait longer between running your city and can easily run out of money before filling out your Building Display which will either cause you to run before all stacks can be used or take some Loans out to forge ahead. On the other end of the spectrum is a city that contains fewer stacks and is run more often. This wastes more actions on running but generally produces less poverty and can get the effects from played cards more quickly. You’ll have to consider the size of your city carefully because once a stack has been started it can’t be removed so once you’re committed to a large city you must stick with it. If you’re going to take a loan it sure helps to have the Bank of England on your side. The tension from poverty is at it’s best in a full 4 player game where the deck gets depleted faster and competition over boroughs is higher. Poverty can be harder to manage and going for a larger city can devastate a player who is trying to squeeze out extra points. To contrast, the 2 player game effectively provides twice as many cards to the players and allows for more boroughs to be purchased so it’s a lot easier to get poverty well managed by the end of the game. It’s still important not to let it get out of hand but a seasoned player will find poverty to not pose as much of a challenge with 2. There is a rather limited amount of interaction in London but one of the most interesting interactive aspects comes in the Card Display. When playing a card there is the opportunity cost of having to discard a card of the same color but this comes with the added kicker of then providing the discarded cards for the other players to draw. This matters more for the specialized blue and pink cards, they are less common and thus provide less options when figuring out which card to discard. In fact hand management is extremely important for fully utilizing the build action, each card requires a matching color and having an odd amount of any color is generally unwanted. There are some cards the can change the color of cards and discard cards from your hand to take care of those odd cards and Paupers. The Underground is a powerful end of game point generator. 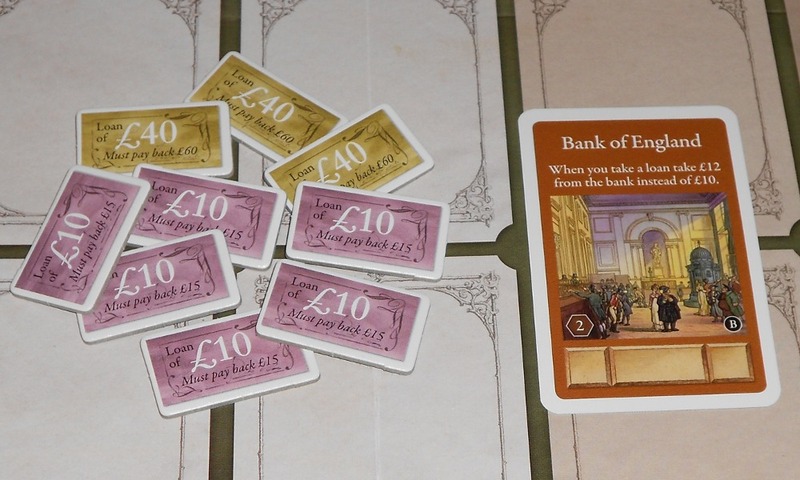 A general theme for economic games is the shift from generating money to generating points. This can be challenging in a game that utilizes cards to provide abilities and may favor those that get access to better income in the early stages. Fortunately London stacks the deck to provide a nice transition of emphasis from money in the early stages to victory points and poverty mitigation in the later stages. There’s still room for generating points early and money later but generally there will be no problem with one player getting a significant boost in income early or key victory point cards later. The card variety also provides nice situational synergies and can lead to drastically different cities between players both in city size and strategy. The design and use of icons is very nicely executed in London. The icons are limited to the basic concepts: money, victory points, poverty, and card draw or discard. That’s it, anything more complicated is explained in text rather than showing a complicated icon that you have to look up on a reference sheet. The card layout flows nicely and is designed to show information that you care about in the different phases from top to bottom. The top of the card shows the title and cost followed by an ability that is active once it is in play. Below that is the artwork followed by the victory point value and activation information at the bottom. Fanning the cards will show the color and cost of the cards which makes them easy to organize and quickly assess which you can afford to build. Trust me, this board isn’t as confusing as it looks. At first glance London may appear more complicated than it actually is, I think this is mostly due to the board. 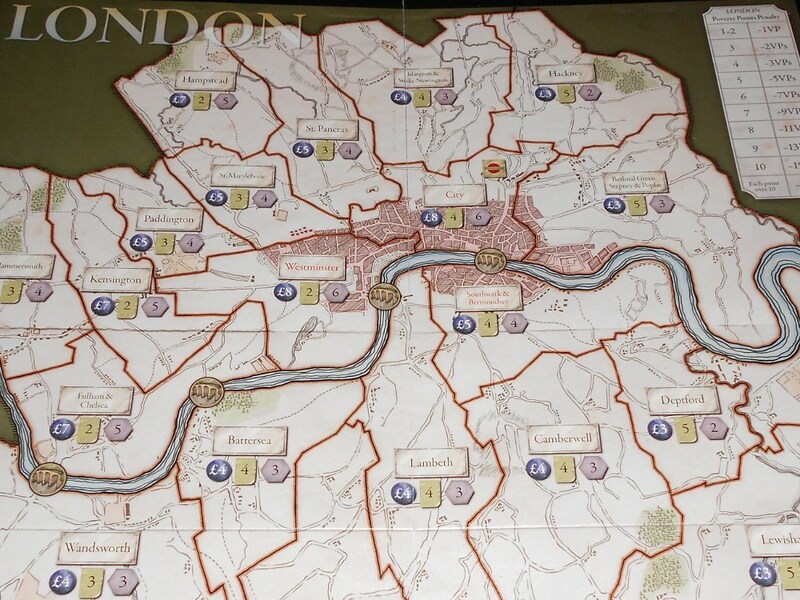 The map of London looks great and is nicely detailed but even though it is a fairly simple design I think it is a little cluttered and can be hard to scan easily. The purchase land action is effectively a card draw action that comes with the added bonus of scoring points and reducing poverty. I find that it often takes longer for players to decide which borough to buy because it appears that there is more to the decision then there actually is. Effectively you are deciding how much money you want to spend for various card draw/victory point splits. Positioning of your boroughs matters for some cards but even those are very simple and don’t really encourage any sort of advanced placement strategies. I like the thematic touch that the map brings to the game but until players learn to parse the information that it provides quickly it will often just lengthen a pretty straightforward decision point.